Monarch butterflies overwintering in California are using predominantly tall non-native trees, especially eucalyptus. There is no evidence that the monarchs overwintered in California prior to the planting of these non-native trees, contrary to the claim of Cal-IPC. Contrary to the claim of Cal-IPC, there is no evidence that eucalyptus trees kill birds. Is Blue Gum eucalyptus invasive? With the exception of an article in “Caspar News,” all evidence provided by Cal-IPC is unpublished. Although the one written source is described as “Caspar News,” in fact its title is “Caspar Newsletter.” The edition of this newsletter that is cited is the first unprinted edition of the “Caspar Newsletter.” Some of the unpublished “evidence” cited by Cal-IPC is described as “personal observations” of Peter Warner, who is the author of the Cal-IPC assessment for Blue Gum eucalyptus. Therefore, the only source of information about the invasiveness of Blue Gum that we can evaluate is the one that is available on the internet HERE. First a word about the town of Caspar, which is located 4 miles north of Mendocino on the coast of California. According to the 2010 census, it has a population of 509 souls. We celebrated New Years Eve there many years ago in a rocking bar, so we have fond memories of it. It is a lovely little town. We mention its small size to put its newsletter into perspective. It’s hardly mainstream journalism. In other words, the “Caspar Newsletter” is merely a repetition of Peter Warner’s agenda to eradicate eucalyptus and poison them with herbicides to prevent them from resprouting. It’s not an independent source of information. We are asked to trust the memory of the photographer about the history of this eucalyptus grove. Credible evidence of spread of the eucalyptus grove would provide dated photographs taken at each period of time represented in this photo, i.e., 1989, 1994, 1999, and 2003. The photographer asks us to believe that the eucalyptus forest is spreading towards the ocean. Given that the seeds of eucalyptus are dispersed by gravity and wind and that the wind is coming from the ocean, we would not expect the eucalypts to spread towards the ocean, but rather on the leeward side of the forest. In other words the “evidence” provided by the Cal-IPC assessment that E. globulus is very invasive is not supported by the evidence that is provided. 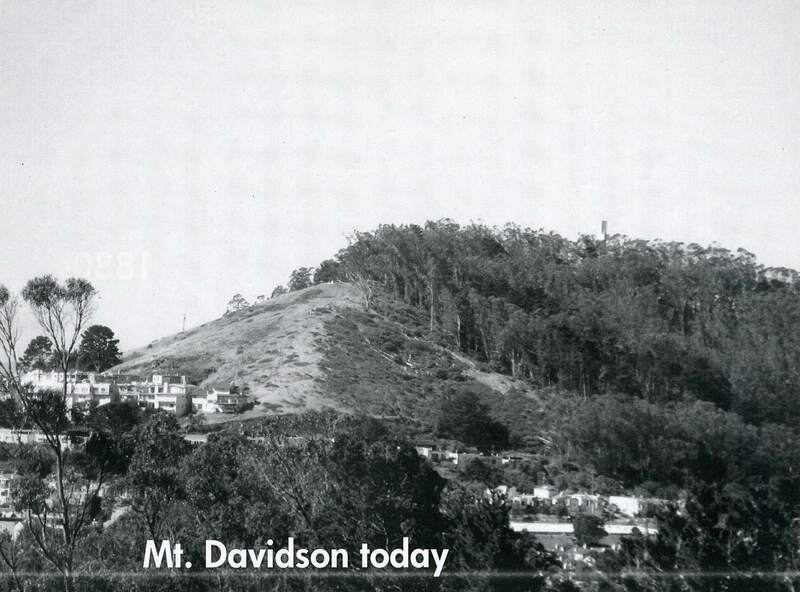 In “Vegetation Change and Fire Hazard in the San Francisco Bay Area Open Spaces,” William Russell (USGS) and Joe McBride (UC Berkeley) used aerial photos of Bay Area parks taken over a 60 year period from 1939 to 1997, to study changes in vegetation types. They studied photos of 3 parks in the East Bay (Chabot, Tilden, Redwood), 2 parks in the North Bay (Pt Reyes, Bolinas Ridge), and one on the Peninsula (Skyline). These photos revealed that grasslands are succeeding to shrubland, dominated by native coyote brush and manzanita. Eucalyptus and Monterey pine forests actually decreased during the period of study. In those cases in which forests increased in size, they were native forests of oaks or Douglas fir. In other words, they found no evidence that non-native trees are invading native trees or shrubs. 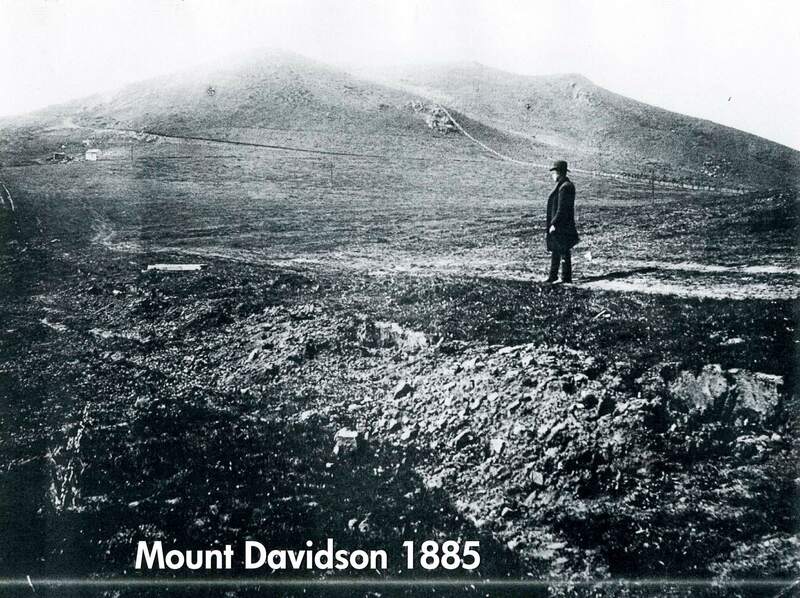 Since Sutro didn’t own all of Mt. 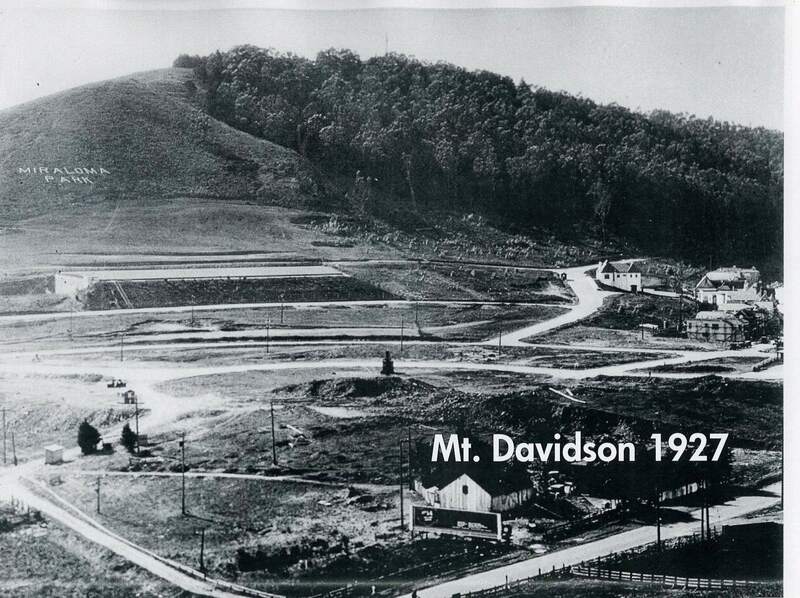 Davidson, there was a sharp line between the forest and the grassland when this photo was taken in 1927. Over 80 years later, in a photo taken in 2010, there is still a sharp line between the forest and the grassland. We see more trees in the foreground where residential areas have been developed and home owners have planted more trees, but the dividing line on the mountain is nearly unchanged. Angel Island is an extremely windy and foggy place because it is located in the San Francisco Bay, close to the Golden Gate to the Pacific Ocean, where wind and fog enter the bay. Eucalyptus seeds are dispersed by gravity and wind. Therefore we can expect seeds to travel further in a very windy place. Optimal soil moisture increases the success of seed germination. Fog drip increases soil moisture and spreading of the eucalyptus forest on Angel Island occurred in drainage swales, where moisture would be greatest. How invasive is Blue Gum eucalyptus? Blue Gum eucalyptus is rarely invasive. The only documented case of significant spread of eucalyptus forest occurred in ideal conditions for seed dispersal and germination. Therefore, Cal-IPC’s claim that Blue Gum eucalyptus is extremely invasive is exaggerated at best and fabricated at worst. If our readers are aware of any other documented cases of spreading of eucalyptus, we invite them to inform us. We are committed to accurately informing ourselves and our readers of the reality of invasiveness of Blue Gum eucalyptus. (2)	“Focused Environmental Study, Restoration of Angel Island Natural Areas Affected by Eucalyptus,” California State Parks and Recreation, July 1988, pg 47 & 51. ← Eucalyptus trees do NOT kill birds! That is a very astute observation and you have made a strong case for your viewpoint on your website. Thanks for adding an important issue in this debate about the value of non-native species and their rightful place in our landscape. We don’t use aesthetic arguments to support our effort to prevent the pointless destruction of non-native species because we consider that a matter of opinion. However, it is a valid argument and we appreciate that you have brought it to Million Trees. Thanks, very informative! I’ve seen tons of pictures of post-“restoration” sites but can’t seem to find any “before and after” photos, of these areas, or of areas showing eucalyptus’ invasiveness. Such photo pairs would seem integral to the debate, and yours of Mt. Davidson here are the first I’ve seen. Hmmmmm, why do you suppose that is? I’m not sure why. I think the burden of proof of eucalyptus’ invasiveness and the efficacy of “restoration” should be on the advocates of action (killing) rather than those advocating non-action (preservation). I conclude that proponents of killing eucalyptus either 1) do not have such photos or have not displayed them because they believe such evidence superfluous, being totally convinced a-priori of eucalyptus’ invasiveness and the efficacy of “restoration,” or 2) do have such photos, but have withheld them since they do not demonstrate that eucalyptus is invasive nor its removal restorative. I too thought it had the feel of loss of the view. I find the dividing line very strange. It would look better fully treed. I think “Badges? We don’t need no stinkin’ badges!” actually comes from an old Humphrey Bogart movie: Treasure of the Sierra Madre. In any case, Blazing Saddles was also a great movie, and the analogy works. Self-styled “ecologists” and “invasion biologists” often don’t ask for, or provide, evidence for their myths. But don’t get me started . . . Anyone interested in seeing in the East Bay how eucalyptus does not spread, I can show you many old, tall eucalyptus living among and next to many other trees as well as in the open, with no encroachment by the eucalyptus. The species of tree diversity is simply increasing the other plant and animal diversity, and is wonderful to be in such a mixed forest. There’s a lovely trail where the hawks, eagles, and owls nest in the eucalyptus, while the woodpeckers and falcons and flycatchers and many other bird species are using the Monterey pines nearby, along with the dying native oaks and bays, with herons and egrets and ducks and other water birds in and near the water, and the coyotes and bobcats deer and rabbits and bluebirds, etc. using the nearby meadow. Anyone who doubts that mixed native and non-native forest has much more diversity that oak/bay forest, come see. So why aren’t the nativists not complaining about the non-native water in the reservoirs, which also increase animal diversity? It’s distressing to hear you say that the oaks and bays are dying. What’s happening? Are the oaks infected with the Sudden Oak Death pathogen? That shouldn’t kill the bays, although they do get infected. Have you visited the SOD map to see if the area you’re talking about is infected? holy S! I don’t remember Blue Gum spreading, We had those fragrant entities in our yard growing up in Concord. But now, the Black Acacia here in Oakland pop up everywhere! My yard has lotsa animals, birds and squirrels love the trees here!